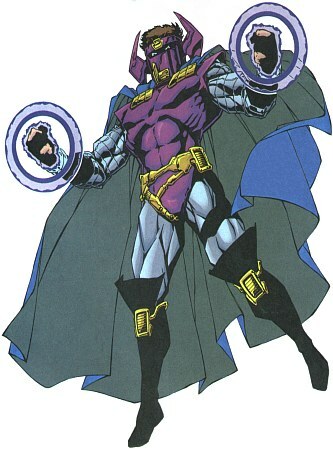 Magnetic Manipulation: Doctor Polaris can shape and manipulate electromagnetic fields that exist naturally or artificially, allowing him to lift and move heavy objects, control ferrous particles in the atmosphere, and even alter the Earth's magnetic field. Electromagnetism: Doctor Polaris has the ability to project or manipulate many forms of energy that are related to magnetism. He can fire bolts of electricity and create enough intense heat to destroy a metal door. Magnetic Force-Fields: Doctor Polaris can erect electro-magnetic force fields with a high degree of impenetrability, protecting himself or others from almost any psionic, energy, or physical attack. Flight: By creating an anti-gravity field around himself, Doctor Polaris possesses the ability to levitate, and inevitably fly and subsonic speeds reaching 500 mph. Neal Emerson and his brother John were raised in an abusive household. Due to the psychological trauma behind those events, Neal became withdrawn and developed a dark side. When Neal was older, he left the U.S. for a year and returned to find that his brother had married a woman named Katherine and adopted a baby he named Grant. Neal was not particularly family oriented, but he was fond of Grant. Neal excelled in medical school and began to develop an interest in magnets. Though ridiculed for his ideas, Neal believed that by using one's mind, magnetism could be used and harnessed by the mind. He becomes an author and lecturer on the idea of "Health via Magnetism." Neal becomes even more immersed in the idea to the point that he came up with the name "Doctor Polaris" and even donned a special costume and mask to use during his lectures. Neal eventually came to believe that his overzealousness has allowed him to absorb too much magnetic energy, and tried to drain off the excess energy without success. Out of options, he decided his best bet would be to make a public appeal at a charity event to Green Lantern. Neal believed that Green Lantern's Power Ring could help him, but an evil persona, part of a split personality chose that moment to take over. He then proceeded to rob the charity event, and ended up getting into a confrontation with the Green Lantern.